I'm just a gardening fool. I love the snipping and pruning. I love to work the soil. I love to pick the blooms. I love to harvest a crop. "English Country Garden" but it is actually a very old English minuet style dance tune. Many thanks to Dave for helping me butcher the classics. play the tune and sing along - misery loves company! There is joy in the Spring - till doggies do their thing in a small suburban garden. I'm a glutton for punishment - play the tune again! Yes, an early Spring has come to Michigan ...and the dogs have tracked most of it inside. Mud, tulip petals, last year's leaves, garden debris - all are creeping in on little dog feet. Cocker ears sweep up unsuspecting slugs and give them thrilling rides through the house before they are shaken off on the bed. Ah, Spring! The time of year when a dog-person's thoughts turn to mud rugs, heartworm tests and flea prevention. The earth springs to life with vibrant new growth...which is then either trampled or rolled in...or devoured outright. One shrub has been pruned from an unsightly 5 foot height to a more compact 3 inch height - courtesy of Duncan, "the Shrub Slayer". Another 8-foot shrub has lost strips of bark from ground level up to 4 feet and the lower branches have been pruned out of existence. Rhododendron bits are lying about. The tattered remains of Spring are everywhere. I have never seen such dog-induced carnage. Wildlife abounds...and stacks of slate from last year's garden re-do are now ant condominiums. Under each pile is an amazing wealth of life. Emma - "The Huntress, The Insect Destroyer" - somehow sensed this and began rather extensive excavations at the piles. Her mission is to wipe out all insect life on the planet in her lifetime. So, on a lovely Spring afternoon, dogmama is moving heavy slate swarming with ants while Emma tags along, stalking her latest victims. Then the holes are then filled with dog droppings. I do this because I read somewhere that dogs will not re-dig holes full of their own excrement - but mainly because the doggie demolition sites are a handy place to dump the load. Fine dining - al fresco...while I shovel the holes back to flat ground, Duncan is munching on the tender new growth of some perennials. His puppyhood ravaged the flowerbed last year and it seems the gaps will remain and enlarge in the coming season. Months ago, I spent $20 on a few bottles of bitter stuff to spray on the kitchen rugs (his snack of choice at the time) and what was left of the shrubbery. I sprayed it on my finger - let him take a whiff and then quickly stuck the finger in his mouth. Now he would associate that smell with an evil taste and leave my stuff alone. Well... that's how it's supposed to work, anyway. Instead, Duncan came back for more. He seems to like the taste. Now I'll be forced to stand guard over the shrubbery with a water pistol or leap from the house flinging pop cans filled with pennies. Add that to my endless litany of NO-BARK! ", "Don't EAT that! ", "DON'T hump your brother! ", "Get OFF the picnic table!" and the neighbors will be whispering again. Dignity and dogs do not mix. Where there's a will...For those who simply must garden and live with dogs (the true meaning of "gardening fools"), I offer these tips as small consolation. Plant only flexible plants - plants that bend and (eventually) stand back up. Brittle plants and dogs don't mix. Irises are brittle. Daylilies bend. Plus, daylilies can be used to make impromptu dog confetti and still come back for more the following spring. Think cheap, think sturdy, think forgiving! Dogmama's Favorite Forgiving Plants - Each has survived my pack for over a decade! Daylilies - Someone is always giving some of the old orange ones away. Take them! You cannot have too many. Mint - For when you're really desperate. Warning - it will take over everything, if not constantly monitored (even your lawn is not safe - mint roots are travellin' fools) but the dog always smell so minty fresh when they run through it. Lamium - Flowering groundcover that can't be beat. Rampant yet pleasant. Lamb's Ears - Can't be stopped without nuclear devices. Peonies - With protection as they come up! Tomato cages work nicely and are soon hidden by the plants. Paint the cages green if they bother you. Phlox - Especially the old fashioned tall ones. Lovely and sturdy - grab some from Grandma's yard! Hostas - Takes a lickin' and keeps on tickin' - IF you give them a little protection when they're first coming up. Plus, someone you know is usually giving some away! Astilbe - Nice variety of color and size for sun or shade. Roses (especially old shrub roses and climbers - My favorite hard working variety is a shrub rose called Betty Prior) - Roses are amazingly resilient and the thorns make them less appealing targets for chewing (although Tristan loved to eat the rose buds). Just don't put them in an area the dogs will run through during play or you'll need to spend some of your gardening fund on vet bills. Flowering shrubs - If low lying flowering plants simply cannot survive you can always get color and scent from flowering shrubs. Buy the tallest ones you can afford. With a little planning - just ask your nursery about blooming times - you can still have flowers most of the summer and keep the dogs! Unless you live with Duncan - the shrub slayer. Don't buy plants. It will only depress you. Trade with other dog-person gardeners or beg resilient looking plants from friends. If they survive you will be delighted. If they don't you won't be waving your Visa statement in the dog's faces. If you must buy (and all gardeners must) test a plant or two for a season before you sacrifice an entire bed to canine carnage. Mulch your beds! Those lovely manicured beds filled with rich dark soil are for other people. You have dogs. Rich dark soil translates into indelible stains when it enters the house on dainty dog feet. Fence the fruits and veggies. Fence anything you don't want to become part of your dog's diet. Make the fence much taller and stronger that you think you'll need and check the perimeter often. Dogs are devious! Arthur was able to reach through the chain link fence, stretch his paw to unnatural lengths and knock tomatoes off the neighbor's vine. Then he painstakingly inched those precious ruby globes closer and closer to the fence. Hours passed, but finally the reward was in reach. The neighbors kept wondering why their harvest was so puny that year. They eventually decided the sunlight was not good enough by the fence and moved Arthur's pantry. Earnest mouthed all the raspberries every day, carefully removing only the ripe ones. He also thought the young pumpkins were squeaky toys and all our jack-o-lanterns that fall had scary scars from his efforts to play with them. Familiarize yourself with poisonous plants (see links at the end of this tale). Many common garden weeds and flowers can be toxic. Upset stomachs, diarrhea and more tragic consequences follow these devils where they go. Some of the plants in my garden are toxic at various levels but I've found it best to just consider everything toxic and train the dogs not to ingest ANYTHING. Still, dogs will be dogs and some unsavory items will go down. They will usually come right back up but watch for signs of distress that may indicate poisoning. Even if your plantings are dog-safe, Nightshade can spring up in a flower bed in just a few days. The good news is most dogs stop eating plants as they get older, but be especially careful if you are raising a pup. Toxic Gardening. Bug sprays, weed killers, fertilizer, fungicides - all are dangers to your dog (and you too!). The active ingredient in Weed Be Gone and other often used lawn weed killer sprays is very dangerous and yet I see many people spraying their lawns and then letting the dogs out. Lawn and tree services are particularly fond of dousing the air and ground with poisons of various sorts and the spray may drift into your yard and onto your dogs without your notice. Papa was once sprayed with pesticide while lounging in the yard. A neighbor was spraying his prized grapes for the millionth time that summer. Those poison granules you spread on your lawn for grubs, ants or earwigs are toxic to birds and certainly won't do your dog any good either. Dogs tend to lick themselves (especially if they get wet) and can ingest all sorts of horrors. Be vigilant. Ask neighbors to let you know when they'll be spraying so you can keep pets inside. Keep all pets, children and other living things off treated areas until there's been a dousing rain. Try switching to organic products when possible. Live with a few weeds in your lawn. The good news is weeds are more resistant to dog urine than grass! Abandon ideals of perfection. Admit that your garden will look best viewed from a distance. Adjust your attitude accordingly. If you have boydogs, you will have yellowed shrubbery. Remove the bottom branches if it bothers you. Plant a lot of everything you find that is dog resistant - allow for the inevitable casualties. When depressed - squint hard. Everything looks better out of focus. Think defense. Tomato cages can keep your peonies and other brittle plants upright and somewhat protected. Don't play Frisbee in your yard unless you can really be sure where that demon disc will land. Otherwise, you may direct your crazed canine right into your prized petunias. I try to put my more brittle plants in front of shrubbery or larger plants. They are less likely to be trampled. Pack plants in tight to discourage easy entry into the "flower zone". Also create "freeways" through your beds for fast moving dogs. If your dog and the neighbor dog run along the fence, start your planting a full dog width from that fence. From your side, you will never see the difference! I have several beds that jut into the yard. One has a planned freeway for dog use and the other is an improvised trail. Might as well make one before your dogs do. Now I deal with 25 pound canine projectiles. You'll need to adjust your defenses according to the size and quantity of your pack. When we had three rambunctious young dogs and brand new perennial beds, we constructed what later became known as the "doggie corral". A 2-foot high wooden fence lining the sidewalk ensured the energetic pack shot straight to the grassy area without ricocheting over into the new beds. It had a cattle drive aspect (yehaw! git along little doggies) that was not visually appealing, but it let the plants establish themselves while the dogs were young. Either design your garden to go with the traffic flow or be prepared to take drastic defensive action! Supervise your dog(s). Dogs left in the yard will create wonderful games and toys with "items" found just lying about. Duncan just loves sticks and will make his own out of living shrubbery if none are made available. Emma likes to excavate a large area to lie in on sultry days. 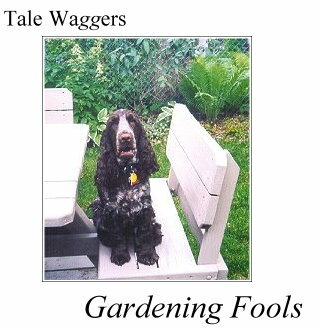 Your garden is filled with the building blocks of doggie fun. Take evasive maneuvers. Provide alternate fun sources like safe hard toys or "fetch till you drop". How long does it take one small dog armed with a 10" ball to completely flatten all the vegetation in 1/4 acre? Answer: less time than you might think.